Today, it has become increasingly difficult for startups to level the playing field. Big brands seem continue to take the lion’s share of the market as they can easily afford all necessary tools and resources required to rule the roost in the market. With such stiff competition in the market, it may seem an impossible task to compete and win but here are 10 best mobile apps that promise to make things easy for you. Right from creating a business plan to creating your website, these amazing mobile apps will surely help you set your startup company this 2017.
Business plan is an important aspect of starting a business. It helps you understand how your business is put together. But creating a clear and concise business plan is easier said than done. And this is where StratPad come to your rescue. This amazing iPad app helps you create a feasible startup strategy. But that’s not it! StratPad also helps you generate reports including financial projections to make it easy for you to pitch your startup to prospective investors. Having a website for your startup is not enough. Not anymore at least. In order to make an impact on your industry, consumers, prospects and investors, you need to invest in a high-quality and professional website design. But given the hefty web design charges, you would need to pay through your nose to get an amazing website. This is where Plebu offers you an optimal solution. It is an app that helps you build your websites without many hassles. And if you’re apprehensive about the quality of the website built with Plebu, you would be surprised to know that websites built with Plebu look great on all devices, from smartphones to tables and desktops to laptops. Once you’re able to take your business off-the-ground, you would need to attract sales and keep a track of qualified sales lead. However, it’s difficult to keep a track of all qualified sales lead and following up on those leads. But with Sellingly, it’s not a difficult task anymore. It is an amazing app that helps you keep a track your qualified leads. With automated email reminders, you wouldn’t forget to follow up on sales leads on a timely basis. BookFresh is yet another interesting app that allows your customers book appointments online anytime. The app syncs your availability details and schedule before booking a customer’s appointment. In addition, the app automatically prompts your customers when they have an upcoming appointment. This app makes sure you never miss an opportunity to make your customers happy. If you’re looking for a perfect voice mail solution for your business, YouMail is one great app for you. It helps you make that first killer impression on your target audiences, clients, investors, and prospects. This app greets callers professionally and provides instant replies with text message. In addition, it also effectively organizes voice mails in different folders for easy access and sharing. One of the thumb rules for entrepreneurial success is effective project management. And if effective project management is what you’re looking for Insightly is your best bet! It seamlessly integrates with Gmail and Outlook 2013 and offers an easy interface, calendar, event planning and social media consolidation capabilities. In addition, this amazing tool also helps you access customer information on the go. 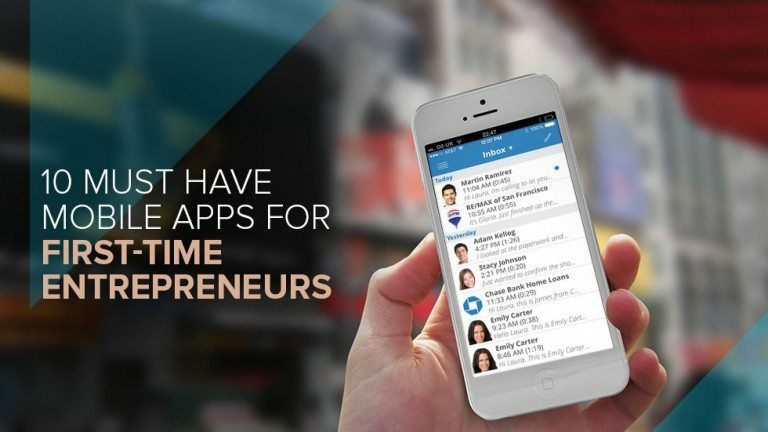 Well, this is one app that almost all first-time entrepreneurs will fall in love with. This amazing tool helps you access any application or file saved on your home or office computer your mobile. Now, don’t worry if you’ve left your best presentation with professional powerpoint design and vital information in your home PC and you’re supposed to meet an investor, you can always access it on the go. Now, if you’re an ever busy first-time entrepreneur who is always on the go, it becomes difficult for you to pay your staff on time. But with Waveapps – Payroll, you can rest assured that your staff is always paid on time. This iOS app helps you run your payroll and payroll history. In addition, this app also enables you receive reminder notifications directly on your iPhone! Zoom is yet another interesting app that makes it easy for you to organize web conferencing, high-definition video and mobile screen sharing on the go. The app allows collaboration of up to 25 participants on one video call. So, you can arrange a conference without worrying about hiring a conference room and paying for the infrastructure. It’s an app that will help you stay connected with your employees, affiliates and investors, no matter what your location. For a startup, expenses are not as big a headache as keeping record of those pesky little receipts and bills. Expensify offers an optimal solution to this. It helps you take photos of receipts, upload them, categorize them and send them to your company’s account department instantly. What’s your favourite mobile app in this list? Let us know in the comments below.